If 2015 was the upturn year for Chain Restaurants, all signs indicate that 2016 will be the year the sector takes off. According to the 7th annual Restaurant Trends meeting, organised by Restaurant Brands, so far this year the sector has grown 7,6% in 2016, surpassing broadly the whole year forecast that stood at 6%. It is great news indeed for a sector that amounts to 1% of the Spanish GNP and generates 135,000 direct jobs. The growth trend will continue throughout 2017, which is expected to see an increase of 4,6%, as was announced in the Restaurant Trends meeting, which was held last October 27th and brought together top executives of the largest chain restaurants groups, cross-sector organisations and an array of experts, gathered with the aim of analysing the current state of the sector and presenting the key trends today. 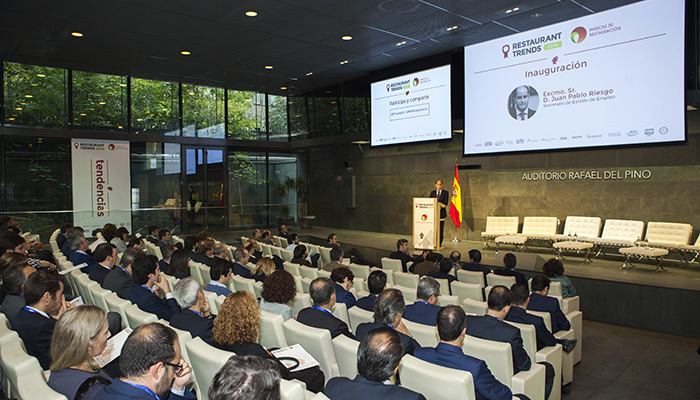 Among the participants it is worth highlighting the presence of the Secretary of State for Employment, Juan Pablo Riesgo; the president of Restaurant Brands, Octavio Llamas; Grupo VIPS CEO, Enrique Francia; the Managing Director of Grupo Restalia, Belén Martín; the Managing Director of Áreas for Spain, Portugal and LATAM, Óscar Vela; Grupo Zena General Manager, Rafael Herrero; and the Executive Director of NPD for Southern Europe, Vicente Montesinos. The conferences combined round table discussions and speakers presentations in which the Hospitality sector was analysed from an economic standpoint and also taking into account the country new political landscape. There were also debates about the sector key issues and trends towards 2020, and an exchange of opinions regarding business sustainability and the value of franchises. It´s all good news for the sector and Eurofrits, given that Chain Restaurant channel represents one of the key segments with a growth opportunity for the company. Currently we distribute products for the main restaurant chains, mostly in the potato families and pre-cooked varieties. In this regard, the most successful products are the Julienne cut chips and the wedge chips with different spices, along with the cheese-based products, ” a family in which we are specialists in developing new recipes adapted the our customers needs”, says Marisa Navarrete, Responsible for Eurofrits Marketing Department and branded Horeca KAM. In brief, our catalogue contains products with our mind set on Chain Restaurants, a sector in full swing. For more info on the 7th annual Restaurant Trends meeting, click HERE.